Our website promises to show you glimpses of Old Florida that require your venturing out on the back roads of Florida. Cabbage Key and its inn and restaurant are truly at the end of the road, west of the Fort Myers-Cape Coral metro area. You can only reach it by boat; there are several day cruises you can take if you don't have your own boat. My preferred way of reaching Cabbage Key is to take a scheduled boat from Pine Island Marina and go out to the inn and restaurant at lunch. Pine Island itself is a worthy day trip. A trip to Cabbage Key is the fun part of the trip; the food is okay, but nothing you would ordinarily drive this far to enjoy. Just enjoy the laid back ambiance. 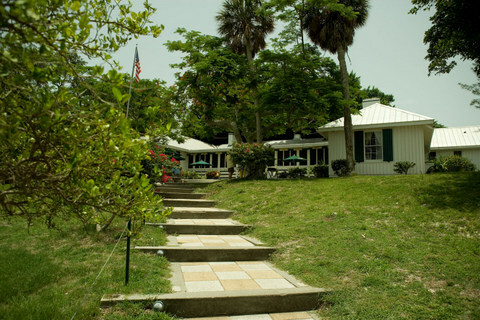 Cabbage Key was a private home for many years before the inn and restaurant were opened in 1944. The restaurant's main claim to fame is that it is reportedly the inspiration for Jimmy Buffet's great song "Cheeseburger In Paradise" (although there are doubters to this claim). There is outside and inside dining at Cabbage Key. 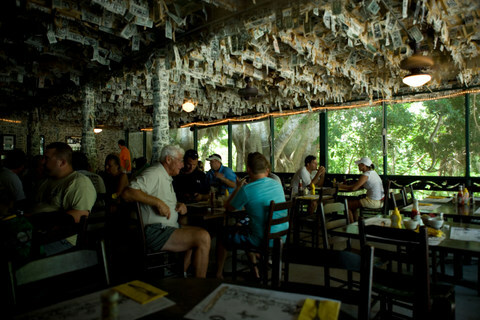 The walls and ceiling of the inside dining room are festooned with thousands of one dollar bills, each bearing the name in magic marker of earlier diners. You will not feel complete unless you leave one of your own. In addition to the famous cheeseburger, other typical tiki bar kinds of food are on the menu here. Plenty of seafood offerings including shrimp, salmon, crab craws, clam chowder and basic salads. Good black beans and rice complement many of the dishes. Sandwich varieties include mahi-mahi, grilled cheese, Reubens, and a lot of other simple fare. Lots of good cold beer. There are also several rooms and cottages for rent; it's a great place to spend a quiet day or two. The rooms are very basic. There is no cable TV out here on Cabbage Key, but plenty of water views. No swimming beaches on the island itself, but you can arrange to have a boat take you to nearby Cayo Costa with its abundant white sand beaches. A trip to Cabbage Key reminds me of trips I've made to the Out Islands of the Bahamas. Don't expect five star hotel and dining experiences; just kick back, relax and enjoy being in a laid back place where time slows down.